When most toddlers are learning to walk, Adam Rawski was taking on the greatest challenge of his life. The 18-month-old had been diagnosed with retinoblastoma, an extremely rare form of childhood eye cancer with a 13 percent survival rate. Rawski somehow beat those steep odds – “I kind of slipped through the cracks,” he says, ever optimistic. “I got through that OK.” – but only at a tremendous cost: the removal of his left eye and, of course, partial blindness. By the time he reached second-grade, though, another obstacle confronted him: bullying. Some of the other boys at Winfield Elementary School picked on him simply because he did not have something they did. And, for a second time, a potential crash turned into a victory. Now 22, Rawski is a junior in the NIU College of Business, where he majors in marketing with a minor in business analytics. He’s also earning a certificate in digital marketing. 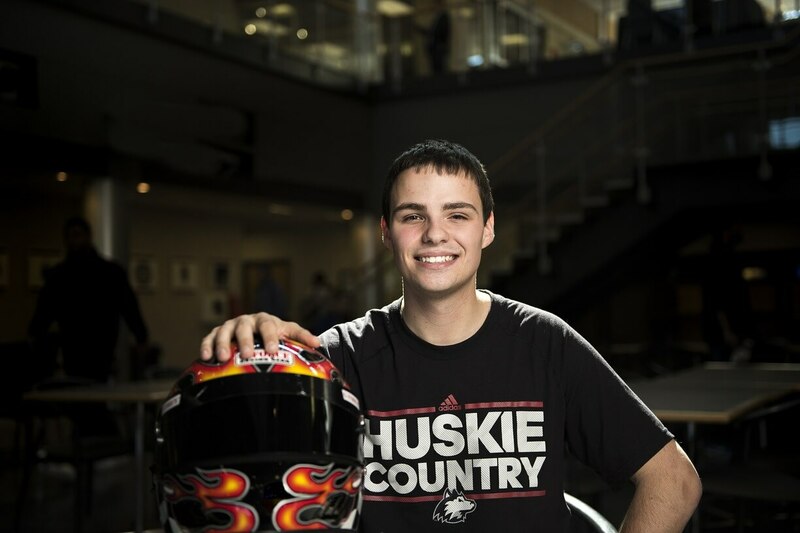 Outside of class, the West Chicago native is in charge of marketing for NIU’s Formula SAE team, a role that includes serving as a liaison with manufacturers and distributors of parts as well as leading the recruitment of new members. He’s also on the executive board of NIU’s American Marketing Association student chapter, working to get fellow Huskies involved in good causes such as Feed My Starving Children. And he’s still racing, no longer in go-karts but in Ferraris and Lamborghinis. The winner of four National Auto Sports Association (NASA) championships also is teaching others as a professional driving instructor with Xtreme Xperience. Fridays mean jumping on airplanes for destinations around the country to teach; recent clinics were held in Charlotte, Houston, Palm Beach, Phoenix and Seattle. He catches red-eye flights back to Chicago early each Monday, returning to DeKalb just in time for his 9 a.m. class. Despite the crazy schedule, he wouldn’t have it any other way. Going fast is not without its consequences, though. Early races occasionally found him smashed into the wall, once on Mother’s Day when he tried to impress his nervous mom by maneuvering his go-kart through the pack en route to what he figured was the checkered flag. Racing, he says, also offers great and universal lessons he loves to share. His career path is a result of racing as well. Five years ago, top management of NASA proposed to Rawski that he become the director of his own racing series, a challenge the 17-year-old accepted in creating and operating Spec Z. He hopes now that he’s also changing lives – and opening the eyes of others.